Galen Cheney detours us away from any expected pleasantries and motors us straight to the gritty and raw levels of the streets, be they our internal, external, peaceful and/or chaotic spaces. 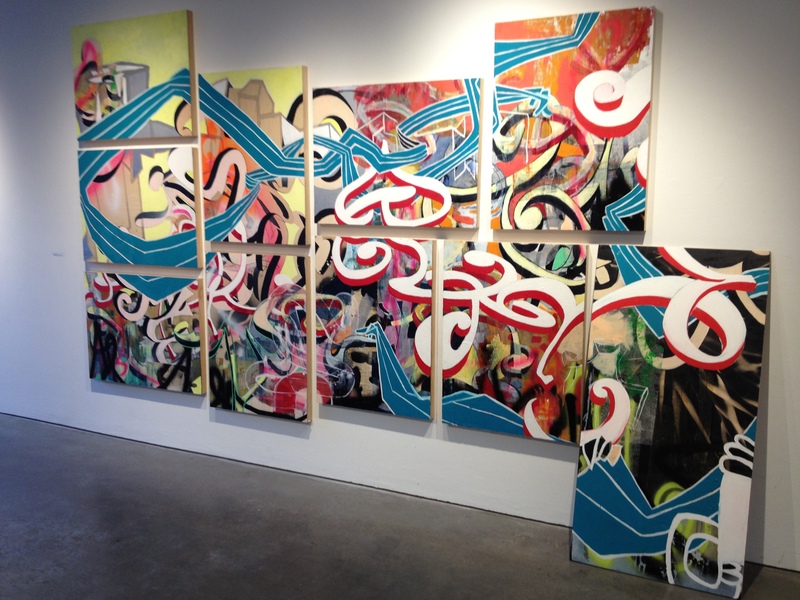 Cheney’s current exhibit Street Level at BCA in Burlington, Vermont, includes the multi-layered, graffiti style abstract pathways of Street Fair, which can be reminiscent of NYC street art in the 1970’s and 80’s. Born in Los Angeles but showing her New England roots through the use of birch panels, Cheney separates and positions these panels in Cross Town and Lariat (lasso type rope) that reveal the disconnections and flow of a city’s accessibility for or from it’s inhabitants. One city and countless ways to move around it or get stuck within it. Cheney inscribes ancient letterforms in urban settings and includes 19th and early 20th century calligraphic lettering, which in some places pop out or hide out among the high-energy spaces of the paintings. 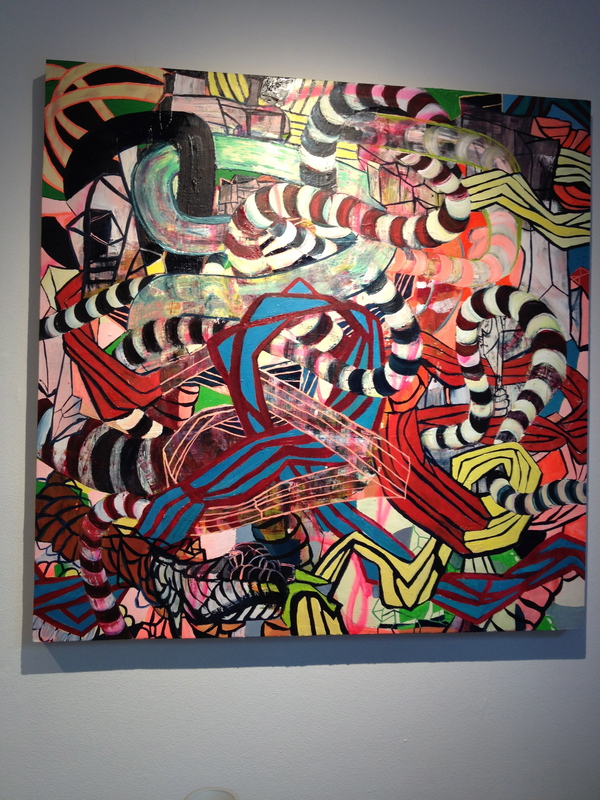 The brilliant colors and labyrinth-style paths, the eyes try to follow, express the vibrancy of a highly alert state. If one is sleeping will they fall off the Dr. Seuss-like striped highways? In the Calligraffiti paintings there’s interconnectivity among the tubular shapes that do not appear to be constrictive. In them Cheney develops her own curvaceous alphabet. The artist describes her work as having it’s “own energy and direction almost apart from [herself]”. When viewing the external scenes, and possibly internal ever-negotiating psyche in pieces such as Periscope, Street Level journeys us out of any lazy-boy cushioned bubble we may live in when we walk through it. Galen Cheney is a Vermont-based artist. Street Level is on exhibit at BCA until June 23rd. 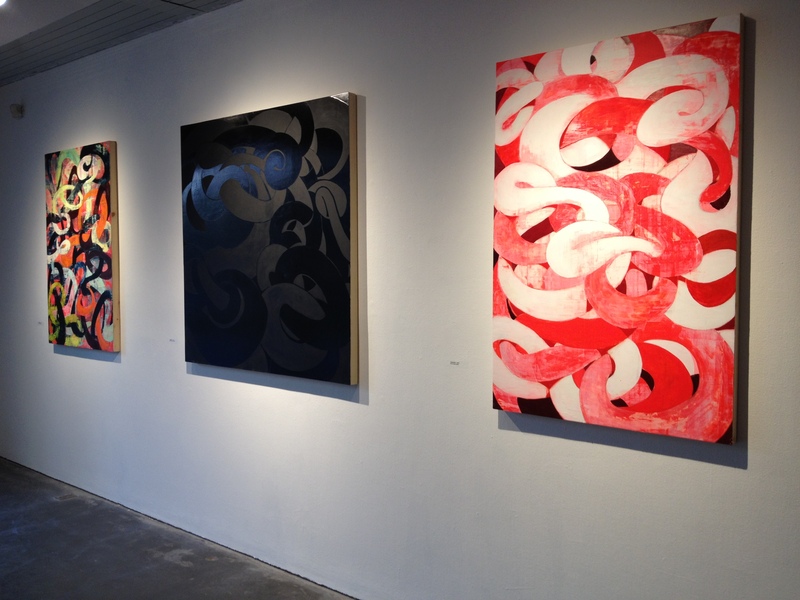 Cheney is currently co-curating Natural Constructed Spaces at The Painting Center in New York City. Thanks Josh. I enjoyed viewing your state designs. What I really like is that they’re all so different from one another. I look forward to seeing the 13 to follow. Nice Etsy shop.